Solar power system: Special discounts on solar panels & batteries. SOLAR POWER SYSTEMS SALE – SPECIALS & DISCOUNTS! 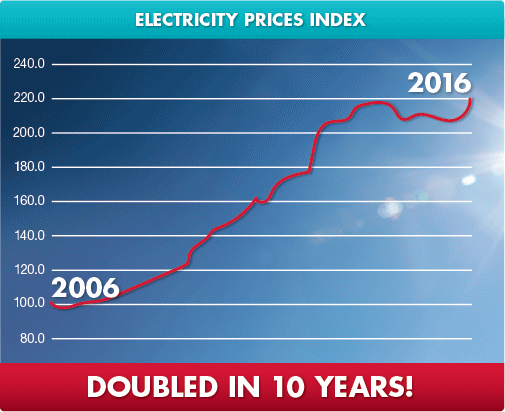 Electricity prices have skyrocketed in recent years. Take back the power over your bill now by having a solar power system installed by Energy Matters! Secure a system while we’re offering our best prices ever, a solid guarantee and while generous government incentives last. Install solar panels and battery storage with Energy Matters . We make the process simple! Electricity prices are up (again) and biting hard. Australia reportedly has the world’s most overpriced electricity before taxes. Solar panels or solar + battery storage can significantly reduce your mains grid electricity consumption. Our friendly team can help you determine the best type and size solar power system for your needs. Contact us using our quote form today or check out our current specials in your state below! Top quality system packages and solar panel installation for households and businesses throughout Victoria – Victoria and Melbourne solar power sale. Queensland households have been slugged again and again on electricity. Beat your bill and install solar panels with these Brisbane and Queensland solar energy specials! Guard against electricity price rises. NSW power costs are only headed one way – up! Limited offer PV package installation deals for home and business – Sydney and NSW solar sale. Capture the energy of the sun, burn a hole in your electricity bills and benefit in other ways from clean, green power! Energy Matters makes installing solar simple. Adelaide and South Australia solar specials! Dramatically reduce or wipe out your electricity bills by going solar with a system supplied and installed by Energy Matters’ professional team! Perth and Western Australia solar deals . Great solar power system packages to help households and businesses save big bucks on electricity in the Apple Isle – Tasmania solar specials! Canberra and ACT residents can harvest the power of the sun to reduce their household carbon emissions and slash their electricity bills. Join the solar revolution – ACT and Canberra solar deals. You can now have an Energy Matters solar power system installed in the Northern Territory by our highly skilled Darwin based installer partners! Check out our Darwin and NT solar offers. Just about every household in Australia can install a heavily subsidised grid connected solar power system under the solar credits program! If you have a bush weekender or live in an area away from the mains grid, our remote power specials have all you need to go solar! We want to help you reduce or even wipe out your electricity bill – and these great specials on quality solar power systems will assist you in doing so! Join more than 23,000 Australian households and businesses who are part of the nation’s rooftop revolution. That is how many are making their own electricity with a solar panel system supplied and installed by Energy Matters. Be sure to bookmark this page as we update our packages, discounts and offers regularly – and let others know about these great PV system deals too!